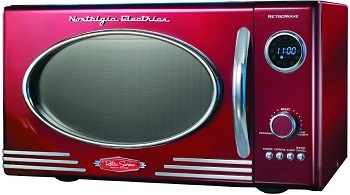 If you’re tired of the plain black, white, or stainless steel appliances, you’ll likely love this retro Nostalgia Electrics RMO400RED microwave, which has a cheery red color, chrome accents, and oval window. Visitors will be sure to comment on its unique appearance, and it will fit in with any eclectic or retro kitchen. And we weren’t disappointed with its cooking performance, either. Although 800 watts isn’t as powerful as some more expensive models, it’s more than adequate for the average heating or defrosting task. We were also pleased with the overall sturdiness and ease of use. The only complaint we had was the turntable, which could use more stability. This model is available for $114.